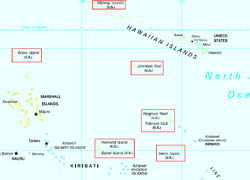 Except for Palmyra Atoll, all of these islands are unincorporated, unorganized territories of the United States. As of 2019[update], none of the islands have any permanent residents. The U.S. Territory of Palmyra Island is an incorporated territory, separated in 1959 from the rest of the former incorporated Territory of Hawaii when Hawaii became a state. The only human population consists of temporarily stationed scientific and military personnel. The 2000 census counted 315 people on Johnston Atoll and 94 people on Wake Island.